Super Mario Land 2: 6 Golden Coins is the sequel to the platform game that appeared on Nintendo's handheld three years earlier. Your quest is to collect six coins, open up the Castle and stop Wario from using his magic spell on the people of Mario Land. On top of the Mushroom and Fire Power items (the latter of which now hops along the ground), there's also a Carrot that allows you to float through the air. Similar to Super Mario Bros. 3 (1990, NES), there's a hub world where you can explore the environment and choose which level to tackle next; this gives the game a more open feel that peaks your interest. During gameplay, the first thing that strikes you is the chunky sprites which are a huge step up from the original. The controls are fine but they're also floaty and Mario's jumps never have any weight to them. The gameplay is lacking in both atmosphere and excitement, and while the level design is good it never really captures your imagination and feels like a generic platformer that had the Mario license slapped on. There are some fun moments though, such as Mario Zone where you slowly descend with rabbit ears while collecting coins and avoiding spikes. The Ghost House stages in Pumpkin Zone are also enjoyable, as well as the Star Zone auto-scrolling level where you avoid hoards of angry stars. There's some secret levels to be found, although they're short and not really worth the effort. Most of the levels pose little challenge but the difficulty skyrockets during the final level due to lava pits and lack of checkpoints; most of the trouble comes from the floaty controls that hinder precision platforming. The bosses are dull and have no charisma, but I do like that you can save your progress in up to three slots. 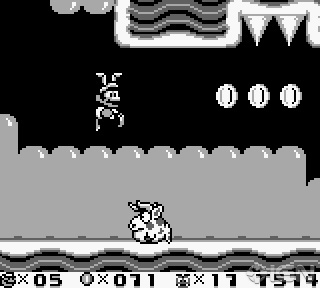 In reality, Super Mario Land 2: 6 Golden Coins should be a superior sequel due to its greater emphasis on world variation, secret levels and graphical upgrades. However, while it still plays well it simply lacks the charm of its predecessor and ultimately ends up being rather underwhelming for a Mario title. Random trivia: The two Super Mario Land titles on the Game Boy are the only two Mario games not to feature any input from creator Shigeru Miyamoto.